It’s no secret that today’s real estate professionals are tired of the stale and traditional business models. Realty ONE Group, one of the fastest growing real estate brands in the nation with a thriving franchise system, continues its record-breaking momentum into the new year. Within the first 10 days of 2018, the company has signed five new franchise agreements, signaling a positive start into what will already be another historic year for the fifth largest independently owned brokerage. About Realty ONE Group: One-hundred percent family-owned and debt-free, Realty ONE Group was founded in 2005 and is proudly known as the industry’s premier UNbrokerage. 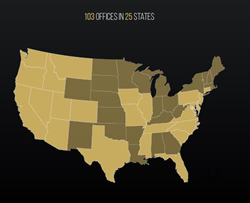 Realty ONE Group has rapidly evolved with over 10,000 real estate professionals in 109 offices across 26 states. Ranked in the top one percent in the nation by REAL Trends, and landing a coveted spot on the Inc. 500 Fastest-Growing Companies list for seven years, Realty ONE Group has been surging ahead, opening doors, not only for its clients but also for its real estate professionals and franchise owners. To learn more, visit http://www.RealtyONEGroup.com.